I hope everyone had a wonderful Thanksgiving! I did take a break from writing last week and feel a bit more rested and ready to present some new issues for your consideration. Diocesan Council met two weeks ago for our first meeting of the new Council year. It was a delight to welcome new Council members and to reconnect with the members whose terms are not yet completed. And I am excited to have some highly motivated members on the Resolution Review Committee. Together we will work to get you the best information we can so that you can share in the mission of the Church! Beyond those municipalities, any person can be legally denied access to housing, employment, public accommodations, public service and educational facilities because they are known to be or are presumed to be LGBT. Every year, Equality Michigan’s Department of Legal Services tracks at least 50 cases of employment discrimination based on perceived gender identity, gender expression or sexual orientation. Targets of discrimination are at risk of anxiety, depression, shame, low self-esteem, self-isolation and self-harm including substance abuse, suicidal thinking and behavior. A number of experts on economic and community development say that the State of Michigan’s non-supportive policies on gay rights are creating barriers to growth and prosperity. “Increasingly, the economy is driven by talent,” said Lou Glazer, president of Michigan Future Inc., a nonprofit that focuses on boosting the state’s economy and talent pool. 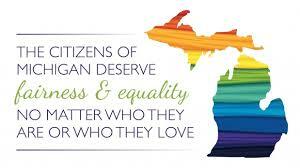 “Talent comes in every dimension, and if you are not welcoming, they are not coming here.” LGBT people are leaving Michigan to relocate to environments that are supportive of LGBT individuals and their concerns, and their families, friends and allies are increasingly unwilling to live in areas that are not LGBT-friendly. *Attend deanery and clericus gatherings to advocate for this concern. *Encourage sermons, homilies and educational forums in your congregation in support of this issue. *Encourage them to advocate for this change with their legislative colleagues who oppose it. *Encourage them to advocate with Governor Snyder for his support. *Encourage them to make public statements of support in newspapers, newsletters, etc. *Invite them to meet with your congregation to discuss their views. Include in the discussion open LGBT individuals and their allies, who can witness to the harmful consequences of discrimination. *Organize inter-denominational and interfaith meetings for similar discussions. *Organize congregational, inter-denominational and interfaith meetings to which you invite both supportive and non-supportive legislators to engage in dialogue about this legislation. *Regularly attend the coffee hours offered by non-supportive legislators, where your views will be heard by other constituents. Include open LGBT constituents and their allies in such meetings. *Visit your legislators’ offices to advocate for this legislation. *Write to your legislators by surface mail. Hand-written letters often carry more weight than typed ones. Personal testimony of discrimination and its harmful consequences is helpful. *Telephone your legislators. If your legislator is not available, ask their aide to share your message. *Write letters to your local newspaper and newsletters and other publications to make your nonsupportive legislators’ views public. Oasis will be asking Diocesan Council to endorse this resolution. We are also inviting individual congregations to adopt a similar resolution simply by substituting their name in the place where the attached resolution says Diocesan Council. If you do adopt this resolution please let us know as the support of religious organizations makes a huge difference with our state legislators. As I write this (Wednesday morning), our state legislature is discussing this very issue. There are amendments being raised that would add the requested wording and others that would take the power to include gender issues out of the act. It’s important that we let our opinions be heard both in our congregations and in the State House. As is true with the other resolutions we consider, this work affects the lives of many people in our communities. The promises we make in our Baptismal Covenant to “seek and serve Christ in all persons” and to “strive for justice and peace for all people, and respect the dignity of every human being” compel us to get involved so that all people may experience equal and just rights. BREAKING NEWS – Just 2 minutes ago (Wednesday, Dec. 3) the Detroit News posted that the legislature did not take a vote today admitting that there’s more work to be done. So, this is our chance to get the word out! Let your voice be heard in Lansing! Thanks, Judith, for bringing this to our attention! Sometimes those of us who don’t experience discrimination need to be reminded of our responsibility to speak up for those who suffer from injustice.